This image was taken on a short hike on Mount Pisgah (part of the original Biltmore Estate) just after 3pm. By having the white balance set for tungsten lighting in broad day light in high contrast, it can give the impression of early morning or night. 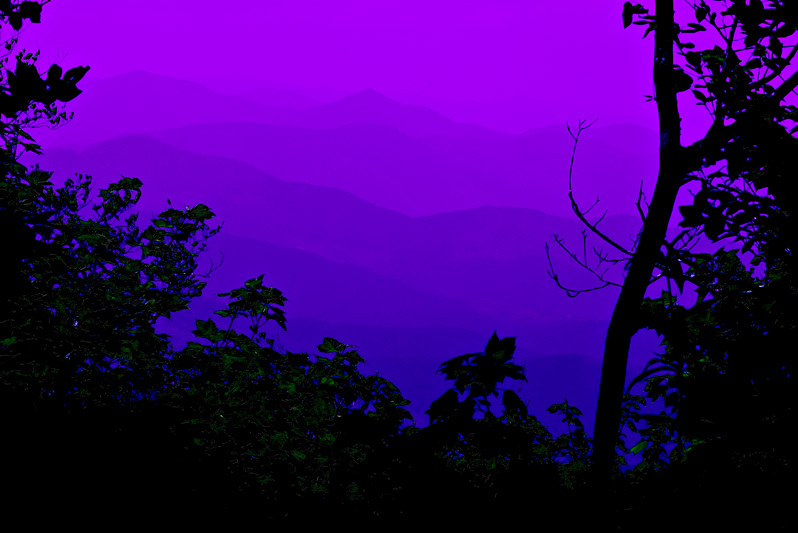 Some other post processing was done, especially on the hue/saturation control to bring some purple into the what would be blue sky, blue mountains and dark greenish leaves. Nice ps work. The color is very nice. I like the sillouettes of the trees and the soft lines of the mountains. Good use of the white balance.Impressive colour and atmosphere.I like the perspective too. Good shot. This is beautiful. A favorite! Makes me miss NC.